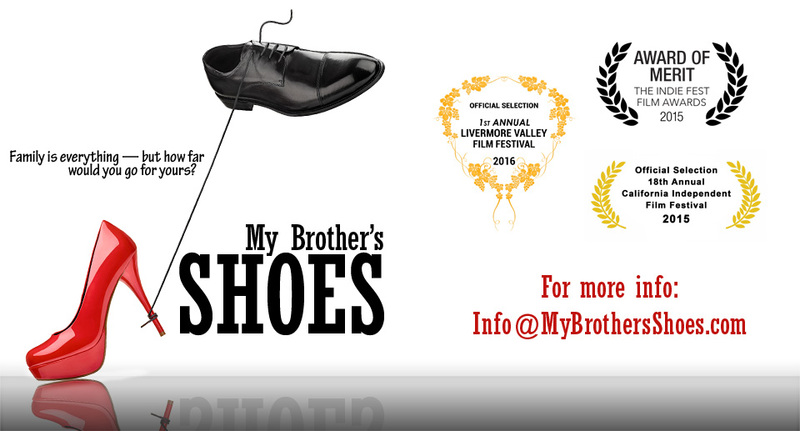 16 Days and counting until the world-wide release of the full feature comedy film “My Brother’s Shoes”!! Keep checking out our website for all the latest updates! Here is another fun scene featuring the talents of Donna Sachet the Emcee of the Ms.Glam Diva Contest! This is one of the high points of the film as one by one the contestants are introduced in front of a packed house. Donna Sachet has a script, but she improvised a lot and put her own incredible style into the role! This scene came out nicely and I have so many to thank – Contestant Number One – Joe Miller – Contestant Number Two – Martin Yribarren – Contestant Number Three – David Lassman “Chablis” – Judges – Alec Kohlervega, Tanya Bordelon, Becky Maher, and Michelle Branchaud Simi. Caroline Wood was the biggest champ – getting all those extras to pack the theatre for the filming! 17 Days until Worldwide Release!! Another great scene (several put together) from “My Brother’s Shoes” coming out June 13th. This scene is the confrontation in the office of the 2 brothers – Dallas (Pete Stringfellow) and Austin (Jacob Ellis) – when they realize they have magically switched places. Funny stuff. With the added humor of Austin’s best friend – the wise-cracking Jackie (Blake Aaron). Mitch, the “cute guy” they refer to, is played by Robert Vann, so it is perfect casting! 18 DAYS until the world release of “My Brother’s Shoes”!!! Here is another nice scene from the film. Dallas, who is straight, never expresses his feelings about having a gay brother, Austin, who leads a crazy life and enters contests for fun dressing in drag. His wife finally asks him how he feels. All this is about to change when, by a magical spell, Dallas has to live as Austin for a day and find out what it is like to live in his brother’s shoes! This scene shows the great acting talents of Gretta Sosine and Pete Stringfellow.